“ordained” here = appointed…or appointed times – Moedim or Moed – a fixed time. This tells us that the appointed times on God’s divine calendar play out on the celestial stage before the events they portray occur in terrestrial time. The Sun, Moon and Stars were placed in the heavens so we would know and understand God’s appointed times. The Blood Moon patterns on Hebrew Feast and Holy days are wonderful illustrations of this precept. A unique attribute about the lunar cycles in 2018 is that on July 27, 2018 there is a Blood Moon that will be the center of a Triad of Blood Moons nearly 7 years from the July Central Blood Moon in the 2011 Triad. Prophetically, 2011 and 2018 are tied together in multiple ways. Does this allude to a Tribulation period of 7 years? Based on these Super Moon patterns, the March 19, 2011 Perigee Moon may have been the start of a celestial prophecy ahead of the Great Tribulation. This cosmic pattern may foreshadow the Great Tribulation consisting of the 7 year “week” as foretold in Daniel 12:7-13. This prophetic sign signals an approximate 7 year Super Moon series 13 months apart, culminating in stellar signs predicting the rise of Four Horsemen of the Apocalypse. The nexus of this end time prophecy was seen in the Fall of 2015, when the Super-Moon Triads converged with the Blood Moon Tetrad on Sept. 28th 2015. It is beyond interesting to consider the points below concerning the last Blood Moon (9/28/2015) of this Tetrad – an ABSOLUTE statistical impossibility, apart from God’s divinely planned design! J. Also during the 2016 Jubilee Year there are 4 additional luni-solar eclipse events occurring on God’s appointed Holy Days directly mirroring the Lunar Eclipse Tetrad of 70 AD marking the destruction of the Jerusalem Temple. This was the last time the Temple was under control of Israel until the 1967-68 Blood Moon Tetrad, when it was regained by Israeli forces during the 6-day war. For nearly two decades I have advocated the concept of a Celestial Prelude that allowed the Magi to recognize the celestial signs marking the birth of Christ, in the well known historical event called the “Star of Bethlehem.” There were a number of critical triple planetary conjunctions and Blood Moons around the King Star–Jupiter, that the Magi recognized as the Star of Jesus–King of the Jews; [Matt. 2:2]. The Magi noted the triple union of Jupiter–Saturn in 7 BC, 4 years prior to the triple conjunction of Jupiter-Regulus in 3 BC marking the birth of Christ. There was also a triple conjunction of Jupiter-Venus that framed the birth of Christ from 3-1 BC, which was documented and seen again in the convergence of the Super-Moon Triads with the 2014-15 Blood Moon Tetrad, leading to the 9-23-17 Rev. 12 sign. With the rise of the Blood Moon Tetrads, most notably the “modern” Tetrads from 1949-50, 1967-68, and 2014-15, we find an increasing emphasis on the series of Super-Moons leading to a 2022 Super-Moon Tetrad. 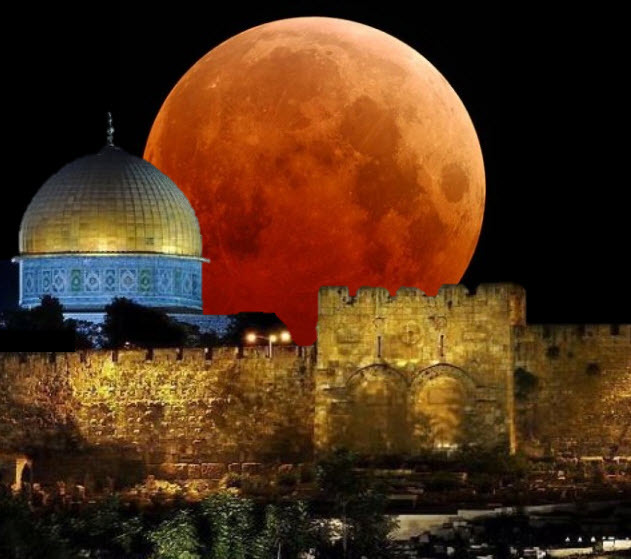 This seems to begin with a single Super-Moon on Jan. 26th, 1948, ahead of the 1949-50 Blood Moon Tetrad marking the formation of the State of Israel. The Lunar Perigee or Super-Moon cycles are consistent and predictable but they usually occur only in pairs. The focus of this study points out that having 3 Perigee or Super Moons in a row is rare; to have two Triads of Super Moons is amazing; and three Triads in two consecutive years is unheard of, anything beyond that is Biblical. Moreover, this Super Moon pattern puts a strong emphasis on the 2014-15 Blood Moon Tetrad. 2015 held 2 Super Moon Triads, totaling 6 Super Moons. There were three New Moons at the start of the year and 3 Full Moons toward the end of 2015. What is singularly amazing is that the 2014-2015 Tetrad of Blood Moon lunar eclipses coincides with the Perigee Lunar cycle of 3 Super Moons in a row in 2014, plus the 2 Super–Moon Triads of 2015! If this was not enough, and what others have failed to notice is that there was yet another Super-Moon Triad in 2016! In the fall of 2016, three consecutive Super-Moons linked with a Luni-solar Eclipse Tetrad on Hebrew Holidays that was mostly missed or ignored completely, due to an adherence to a mathematically based Hebrew Calendar instead of determining Hebrew Feast and holy days according to the Bible based standard of sighting the New Moon. These 2016 celestial signs are charted below. 1st Super-Moon of Triad-October 16th, 2016. 2nd Super-Moon of Triad- November 14th, 2016. 3rd Super-Moon of Triad- December 14th, 2016. 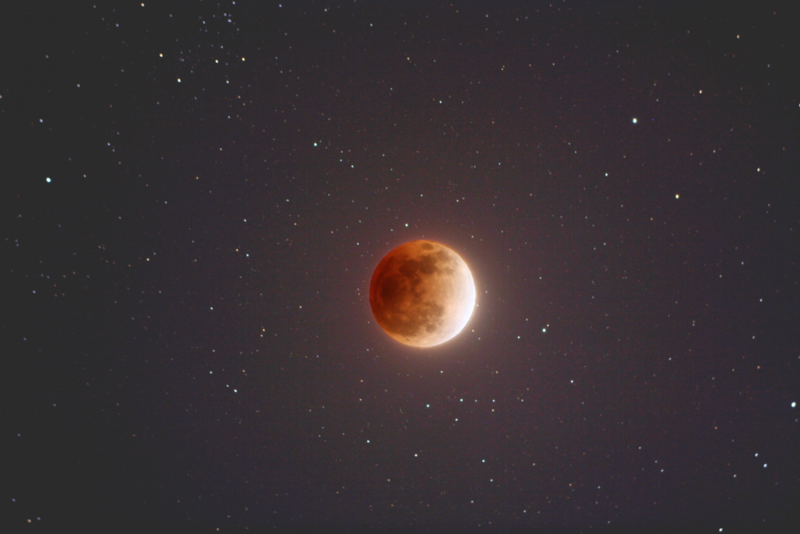 The Sukkot Super-Moon that capped the 2014-2015 Blood Moon Tetrad on September 28, 2015, followed a Partial Solar Eclipse as seen in our August 2015 Blog. This is notable in light of the Partial Solar Eclipse later this month on February 15th, 2018, 2 weeks after the Jan. 31st Super Blood Moon! This series of Super-Moon Triads bracket the Blood Moon Tetrad, while linking this series to the 9/23/17 Rev. 12 sign via the Tetrad of Eclipses on Hebrew Feast and Holy days in 2016, as we summarized in our Sept. 2016 Blog. The Penumbral Lunar Eclipse during Sukkot week from 9/16 to 9/23/16 aligned with the 9/23/16 Sukkot feast exactly a year later in the Rev. 12 sign of 9/23/17, providing a continual link between the Luni-Solar Tetrads of 2014-2016 to the Rev.12 sign of 9/23/17. Thus we can see how the Super-Moon Triad in July, August and Sept. of 2014 opened the 2014-2015 Blood Moon Tetrad, while the 2016 Super-Moon Triad included the 2016 Luni-Solar Eclipse Tetrad in an awesome display of Super-Moon symmetry related to both consecutive Tetrads. The Super Moon Triads thus validate the prophetic status of the modern Blood Moon Tetrads. Both celestial series converged at a singular point on the Hebrew Calendar, Sukkot of 2015. Does this near 7 year period foreshadow the 7 year Great Tribulation? If so, it could also mark the 50 year Jubilee; [1967-2017] if counted from the liberation of the Temple Mount in Jerusalem in 1967. September 2015 also started a new Jubilee cycle. The new Jubilee opens with the Sept. 13th, 2015 Partial Solar Eclipse, and is unique as the 40th Jubilee year since Jesus was crucified. “These are very significant biblical dates, and now we have two Blood Moons in January of both 2018-19 bracketing the central Blood Moon in July of 2018 on Tu B’Shevat.” Biltz goes on to say, “The eclipse takes place on Tu B’Shevat on the Biblical calendar, the 15th day of the month of Shevat. This is important because this Blood Moon eclipse is only one of a Triad series. The next one is on July 27, which is Tu B’Av or the 15th of Av on the Biblical calendar. The following one is Jan 21, 2019 – which just happens to be Tu B’Shevat again!”6 Here again we find a Super-Moon Triad that includes the Dec. 3rd Super-Moon in Virgo as the only one in 2017, with 2018 opening with another in Taurus on New Year’s Day! This Triad is completed on Jan. 31st with the Super-Blood Moon. This is the 3rd convergence of Super-Moon/Blood Moon Triads since the two in 2015 showing a convergence series of these lunar signs. According to Judaism 101: “Tu B’Shevat is the new year for the purpose of calculating the age of trees for tithing. The fruit from trees may not be eaten during the first three years; the fourth year’s fruit is for God, after that, you can eat the fruit. Each tree is considered to have aged one year as of Tu B’Shevat.“7 The Biblical significance of this more minor Hebrew holiday of Tu B’Shevat is found in Leviticus. 21 And he shall bring his trespass offering unto the Lord, unto the door of the tabernacle of the congregation, even a ram for a trespass offering. 22 And the priest shall make an atonement for him with the ram of the trespass offering before the Lord for his sin which he hath done: and the sin which he hath done shall be forgiven him. 23 And when ye shall come into the land, and shall have planted all manner of trees for food, then ye shall count the fruit thereof as uncircumcised: 3 years shall it be as uncircumcised unto you: it shall not be eaten of. 24 But in the fourth year all the fruit thereof shall be holy to praise the Lord withal. 25 And in the fifth year shall ye eat of the fruit thereof, that it may yield unto you the increase thereof: I am the Lord your God. Ever since Israel regained its statehood in 1948, this holiday of planting trees has taken on a symbolic significance as more and more Jews return to their homeland, from their diaspora around the world; [Isa. 11:11, Jer. 16:13-16]. The harvested crops of these planted trees were to be decided in their tithes of first-fruits by Tu B’Shevat. This also fulfills God’s promise to Israel regarding their homeland, a pivotal sign in the last generation of the end times that will witness the return of Christ. We also find added spiritual light shed on this as we consider the 1st Psalm. 3 And he shall be like a tree planted by the rivers of water, that brings forth his fruit in his season; his leaf also shall not wither; and whatsoever he doeth shall prosper. Here we see the people likened to planted trees. Each brings forth fruit in their season, when they are acceptable to the Lord. At the proper time Jesus will return for the harvest. Jesus knew the right time and season to open his ministry, when the Heavenly Father revealed it to him on a certain Sabbath he read from the book of Isaiah in the Synagogue. 3 To appoint unto them that mourn in Zion, to give unto them beauty for ashes, the oil of joy for mourning, the garment of praise for the spirit of heaviness; that they might be called trees of righteousness, the planting of the Lord, that he might be glorified. 4 And they shall build the old wastes, they shall raise up the former desolations, and they shall repair the waste cities, the desolations of many generations. As Jesus referenced this verse in Luke 4:18-19, he stopped at the comma after the acceptable year of the Lord, because the day of vengeance was still future as it remains today. However we are much closer to seeing God’s day of vengeance than Jesus was in 27 AD. As dwellers in the end-times we know the Lord is preparing to return to reap the harvest of his trees of righteousness that were spiritually planted during his first advent. Figure 4. 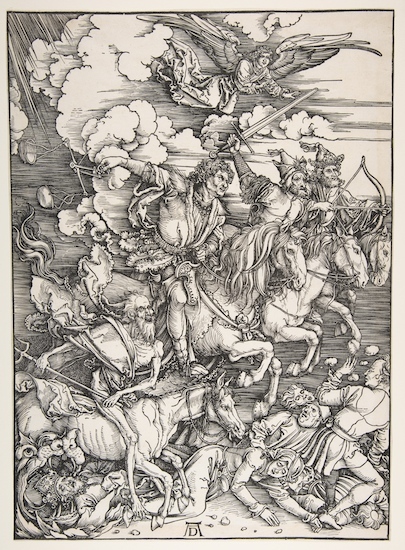 The Four Horsemen of the Apocalypse woodcut. Upon the four and twentieth day of the eleventh month, which is the month Sebat, in the 2nd year of Darius, came the word of the Lord unto Zechariah, the son of Berechiah, the son of Iddo the prophet, saying, I saw by night, and behold a man riding upon a red horse, and he stood among the myrtle trees that were in the bottom; and behind him were there red horses, speckled, and white. Israel’s 70 years as a State began in May, 1948. This was marked astronomically by a Mars-Regulus Triple union in Leo, along with the first of the modern Blood Moon Tetrads in 1949-50 as seen below. The first Mars retrograde marked the Mars-Regulus triple conjunction in 1947-48. The closest Super-Moon since the recent Jan. 31st Super-Blood Moon fell between the 1st and 2nd Mars-Regulus union in Leo, on Jan.26th, 1948. In view of the link to the 1948/eclipse comet and the forming of Israel’s state, we find an emphasis on the 70 year period from 1948-2018. The last 7 years of this period are highlighted by the Super-Moon/soli-lunar eclipse signs, while marking the Hebrew Jubilee of 5777. During the 2017 holidays, there was a Christmas Day union of Saturn and Venus in Sagittarius! On Dec. 25th, 2017 Venus the bright and Morning Star united with Saturn, showing Christ’s victory over the evil one, as seen in Sagittarius where our quickly returning Lord Jesus Christ is portrayed in triumph, conquering to conquer! 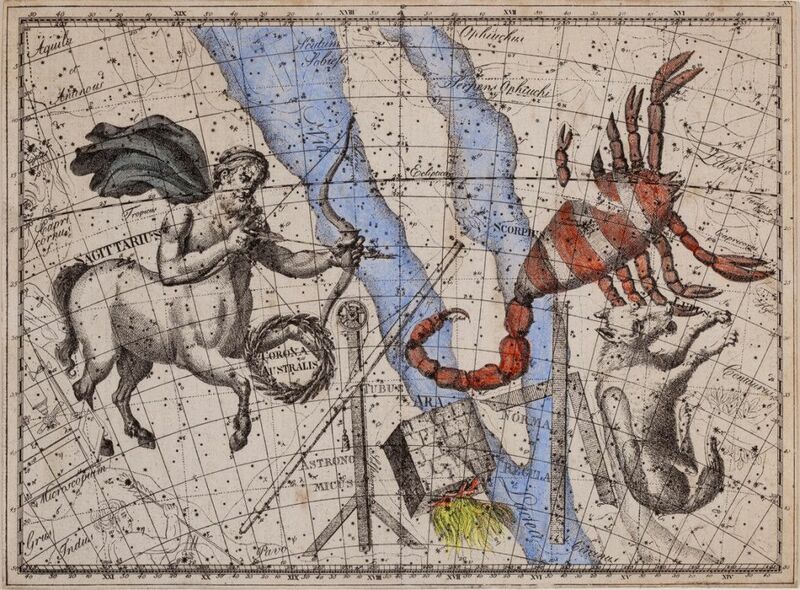 Here the star picture of the mounted Archer has his arrow aimed at the red heart of the Scorpion–Antares, while Ophiuchus’ foot crushes the Scorpion’s heart. As we noted in our previous blog post, Saturn had just completed its triple union with Saiph, the star in Ophiuchus’ other foot which was stung by the Scorpion, bruising the heels of the 1st and 2nd Adam, [Gen. 3:15]. This shows Satan’s persistent evil to obstruct God’s purposes any way he can, even though his defeat is sure. This planetary conjunction near the conqueror’s Bow, shows the deadly accuracy of our Lord’s aim [Figure 5] to destroy the works of the enemy, [I John 3:8b]. The Hannukah feast and celebration is founded upon the defiling of the Jerusalem Temple by Antiochus IV. As a forerunner of the future anti-Christ who will declare himself-God in the 3rd Jerusalem Temple [2 Thess. 2:3-12], the celestial signs surrounding Hannukah deserve closer scrutiny. We find during Hannukah week on 12/17/2017, a massing of planets in Ophiuchus, [Fig. 5] and Venus unified with Saiph the star in the Serpent-bearer’s bruised foot. This depicts the bright and Morning Star Venus in unity with the star that embodies the wound endured by the Son of Man for all mankind. In light of the false Christ, it may foreshadow the deadly wound that the anti-Christ will be healed from, causing the world to wonder after him, [Rev.13:3]. This planetary alignment in Ophiuchus includes the presence of Mercury, and the Sun. Also both the Moon and Venus are located in Ophiuchus’ wounded leg. This takes place eight days prior to the Christmas day union of Venus and Saturn in Sagittarius. Sagittarius like other Mazzaroth signs can have a dual meaning depending on the planets occupying its space. In the classic sense of the Sun moving in the 12 houses of the Mazzaroth [Ps. 19], each sign carries a specific meaning relating to the Sun of God-Jesus Christ, [Mal.4:2]. However, when a planet like Saturn-Satan enters a sign of the zodiac, it carries a darker significance related to the enemy. Normally, the 12 Mazzaroth signs tell of the Christ, but when we see Saturn in Sagittarius we may also be viewing signs related to the anti-Christ, especially during Hannukah with its historical links to forerunners of the Son of Perdition.